Directed by Dee Rees and written by Rees and Virgil Williams from Hillary Jordan’s novel, Mudbound tracks the relationships between the white McAllan family, who recently bought a farm in Mississippi, and the Jackson family, who live and work on the land, before and after World War II. Although some of the elements may feel familiar—racism in the pre-Civil Rights-era South is well-trodden territory in both literature and film—Mudbound mixes race relations with PTSD, alcoholism, abject poverty, the horrors of war, masculinity, depression, and a Southern Gothic style, giving the film an epic feel that explores the full breadth of human emotion. As much as it is a movie about bigotry and discrimination, it’s also a film about the universality of pain, depression, and suffering—and how that pain can trickle down and turn back into bigotry and discrimination. Even though the majority of the characters face poverty, the script makes it clear that a racial hierarchy pervaded 1940’s rural Mississippi, both through subtle moments like Henry McAllan’s treatment of his land’s tenants to the explicit epithets Henry’s father frequently spouts, and this hierarchy simmers throughout the film until it finally boils over in a climax brutal and distressing in its realism. Rees and Williams’ Academy Award–nominated script turns frequently to voice over, allowing the audience to get inside the heads of each of the six main characters. Though voice over often becomes a liability in lesser hands, the narration (coupled with Rees’ cerebral direction and cinematographer Rachel Morrison’s Oscar-nominated cinematography) gives the film a poetic feel in which the characters’ shared experiences and diverging perspectives fold on each other to paint a complex, unflinching, and epic portrait of the era, recalling older human dramas like John Ford’s How Green Was My Valley and The Grapes of Wrath. “Show, don’t tell” is an enduring saying that will likely never go away, but the elegiac elegance of Mudbound’s voice over justifies itself, college writing course axioms be damned. 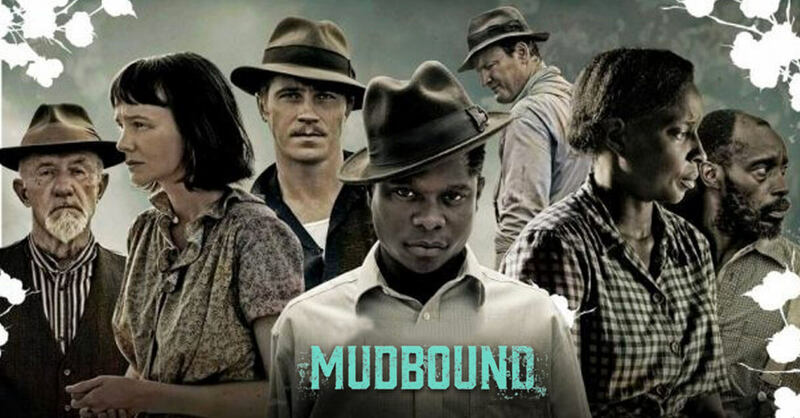 Mudbound is a rarity in modern film—an epic character study about racism that not only does justice to each of its characters but also looks to the past to tell a story relevant to our present. For that alone, it’s necessary viewing—and it’s on Netflix, so if you’re a subscriber, you’ve got no excuse.